Before you guys read, I realize I put an extra week before Hell in a Cell, because I kind of need it. Anyways, enjoy. I nervously walked the hallway of the locker room, keeping my eyes open for the men in black. Andy was walking backstage beside me, he had decided to stay for Raw. I had been able to get him front row tickets. I turned to him, "I think you should get to the audience. Raw is going to start." "Alright," Andy agreed. He gave me a kiss on the cheek before walking off. I walked the opposite direction until I got to the divas locker room. I opened the door and walked in. Brie, Nikki, Naomi, Cameron, Natalya, Eva, and JoJo were all in there. Natalya got up right away and walked over. She put her hand on my shoulder, "You doing ok?" I sighed and hauled my bag into my space of the locker room, "I&apos;m just fine." "You don&apos;t sound fine, girl, you want to talk about it?" Cameron asked as I sat down. I shrugged, "I&apos;m thinking of doing something tonight, but I&apos;m afraid it&apos;ll completely backfire on me." "What are you doing?" Brie asked. I was about to say, but I grinned at the seven of them, "You&apos;ll have to tune in tonight." "Come on, tell us," Nikki begged. A producer knocked, then poked her head in, "Gabby, Triple H said he would give you time at the beginning of the show. Your up in ten," she disappeared. I took a deep breath and stood up. I quickly zipped my sweat shirt off, revealing my custom T Shirt. It had &apos;Destroy the Authority,&apos; on the front and #badforbusiness on the back. It was white with black wording. I also wore white jeans, and white osiris&apos;s.
"Are you sure you should be wearing that out there?" Brie pointed to my shirt. "I don&apos;t give a sh*t," I muttered before walking to the door, "Wish me luck," I called before opening the door and walking out. "Hello ladies and gentlemen and welcome to Monday Night Raw!" Michael exclaimed as the crowd cheered. My theme, Unstoppable, hit and the fans got louder. "We are starting off the night with Gabby. 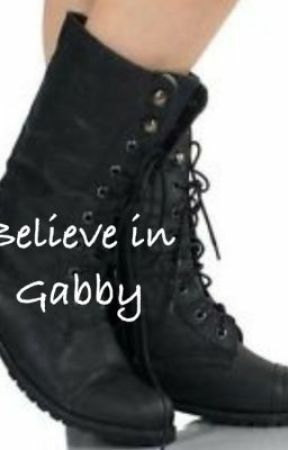 There have been rumors all over this week about Gabby leaving the Shield. Gabby would confirm these rumors on her twitter this weekend. Gabby has in fact left The Shield. We&apos;ll finally get some answers, right now, Michael informed the audience. I stepped onto the stage as the crowd cheered. I grinned as I spun around and pointed to the back of my shirt. I spun back around and pointed to the front before making my way down the ramp. "There she is!" Jerry exclaimed. For once, I didn&apos;t tag the fans hands. I walked right to the steel steps and walked to the apron. I got in the ring and went to get a microphone. I spotted Andy in the front row. I stared at him for a few seconds before looking away. My music cut as the fans got completely quiet. I put the microphone to my mouth, "Look, I&apos;m going to cut right to the chase. I did escape the Shield last week." I was surprised at the mixed reactions, I continued, "I know a lot of people want a full explanation, but I&apos;m afraid I can&apos;t give you that. That would mean putting my personal life out there and I would like to keep my personal life personal.